Twenty-one undergraduates are heading to Brazil and India over winter break to put into action the University’s motto, Pro Humanitate. 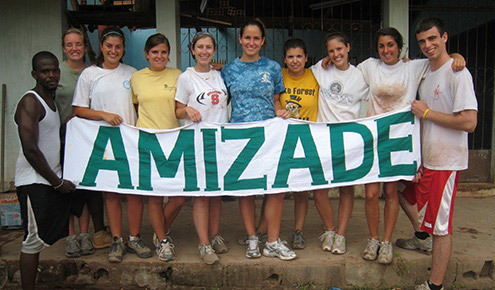 Ten students are going to Santarem, Brazil, with the nonprofit group Amizade to help build a community center for children. During the two-week trip, the students will also visit the rain forest, take a trip down the Amazon River, and explore many different towns. Eleven students are headed to Calcutta, India, to volunteer with the City of Joy program. They will change beds, bathe patients, clean wards, and feed and comfort the sick in homes for children and the destitute run by Mother Teresa’s Missionaries of Charity. Each trip will be lead by a student leader who has participated in that particular service trip before, and each group will be accompanied by a staff adviser. Both groups will leave on Dec. 27 and return Jan. 12. Wake Forest students have participated in annual service trips over winter break since 1994, when Jessica Davey (’95) went to Calcutta to volunteer with Mother Teresa’s Missionaries of Charity. Since then, students have volunteered in Honduras, Mexico, Costa Rico, South Africa and Vietnam, and in Mississippi and Tennessee.